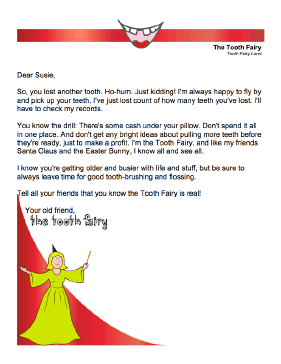 For older children who may be skeptical of the Tooth Fairy, or just in it for the money, this printable letter adds humor to the situation. So, you lost another tooth. Ho-hum. Just kidding! I'm always happy to fly by and pick up your teeth. I've just lost count of how many teeth you've lost. I'll have to check my records. You know the drill: There's some cash under your pillow. Don't spend it all in one place. And don't get any bright ideas about pulling more teeth before they're ready, just to make a profit. I'm the Tooth Fairy, and like my friends Santa Claus and the Easter Bunny, I know all and see all. I know you're getting older and busier with life and stuff, but be sure to always leave time for good tooth brushing and flossing. Tell all your friends that you know the Tooth Fairy is real!